Visual Integrity® has upgraded its three PDF SDK’s. Together, the PDF Conversion SDK, PDF Creation SDK and Custom PDF SDK provide a robust, multi-platform, set of PDF libraries for Windows, OS X and Linux developers. The SDK’s can be used to open and edit PDF drawings or diagrams within an application or service, extract text, implement object snapping, and more. 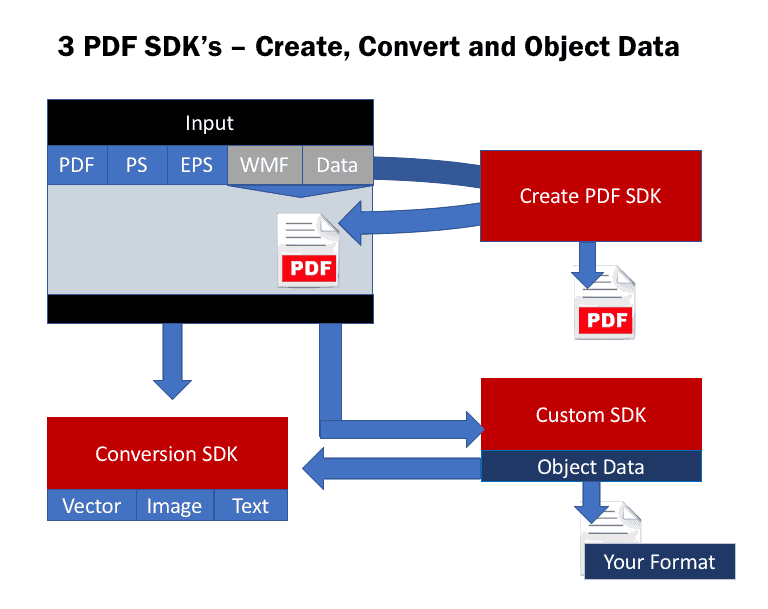 The PDF Conversion SDK enables developers to open and edit vector-based PDF files within their application or web-service. Using two API calls, vector PDF files render as editable objects in target applications, such as CAD programs or Visio. The PDF Conversion SDK also extracts text. The PDF Creation SDK enables PDF generation as well as actions such as merge, watermark, stamp and extract. PDF files can be created from data, scratch, or from existing files. Content can be added and pages can be combined. Performance is enhanced since, unlike most of today’s converters, pages do not pass through a printer driver. 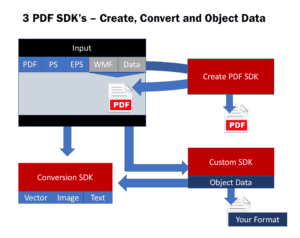 The Custom PDF SDK gives developers direct control over all the objects and text in a PDF file. It can be used to pre-process PDF files, extract specific objects or change objects before importing. Developers can map their native file format to the Custom PDF SDK allowing them to manipulate layers, implement snapping or change attributes from within their own application. New API functions to control scaling, layer separation, file-naming, Unicode support, clipping, password protection, page extraction, image quality and warnings. Options to specify fill, change images to color lines and for ellipse rotation. Improvements to hidden text functionality, font mapping, Unicode filenames, SVG object styles, EMF kerning, DXF layers, EPS fills, PDF parser and rotation. Graebert GmbH, leading developer of custom CAD solutions for desktop, mobile and cloud, used Visual Integrity’s Custom PDF SDK to implement snapping in ARES® Commander. They also used the PDF Conversion SDK to build the PDF Import Plugin for Draftsight™. D-Tools Inc., the worldwide leader in system integration software, utilizes Visual Integrity’s Conversion SDK in its PDF Cloud Converter, a notable drawing feature in the company’s System Integrator (SI) platform that improves the PDF insert process for its users. “Our SDK framework has matured to a point where developers can integrate it in less than a day”, said Jean Haney, co-founder and CEO of Visual Integrity, “It’s that easy to meet their customers’ demand to open and edit PDF drawings or to work with PDF objects and text within their own application”. The Visual Integrity PDF SDK’s are available in two ways – as a perpetual license with optional maintenance or as an annual subscription. Prices for the perpetual license start at $199 while prices for the annual subscription start at $299/year. An evaluation version of the entire PDF developer framework may be downloaded on the Visual Integrity web-site. Visual Integrity is an early pioneer and leader in PDF and vector graphics technologies. Since 1993, Visual Integrity has been developing solutions to reuse, repurpose and unlock vector-based content such as drawings, diagrams and technical illustrations. The company has turned its 25 years of vector graphics expertise into desktop programs, such as pdf2cad and pdf2picture, as well as a PDF SDK framework for developers and systems integrators including the PDF Conversion SDK, PDF Creation SDK and Custom PDF SDK. Visual Integrity has offices in The Netherlands and Portland, Maine. Graebert GmbH, with over 30 years of experience in the industry, is recognized as a true innovator in desktop, mobile and cloud CAD solutions. Their “Trinity of CAD™” concept includee multi-platform ARES® Commander for the desktop, ARES Touch™ for smartphones and tablets, and ARES Kudo™, a full browser based solution. Graebert’s OEM CAD engine powers OEM products including Draftsight™ from Dassault Systems, Onshape™ Drawings from OnShape and CorelCAD™ from Corel Corporation. The company, headquartered in Berlin, also has offices in America, Europe and Asia. D-Tools, Inc., founded in 1998 and based in Concord, California, is a worldwide leader in accessible, highly accurate system design and documentation software platform. The company’s flagship product, System Integrator™ (SI), is a robust solution that utilizes Autodesk® AutoCAD and Microsoft® Visio to facilitate comprehensive system design, documentation and project management. D-Tools enables residential and commercial integrators to streamline business processes and increase revenues while reducing the time and cost associated with the installation and integration of low voltage electronic systems. More than 5,500 leading companies in 87 countries currently use the award-winning D-Tools platform to reduce time, costs and to streamline the system integration process. Visual Integrity is a registered trademark of Visual Integrity Technologies LLC. All other trademarks and registered trademarks previously cited are the property of their respective owners and are hereby acknowledged.